If you are seeking an off the beaten track Halong experience then this 3 day, 2 night Bai Tu Long tour is for you. Lying beyond Halong Bay, far from the major cruising routes, Bai Tu Long Bay is remote and majestic. Spend three days among its magnificent limestone peaks and azure waters for the trip of a lifetime. On this tour you will have the luxury of waking up on the boat on your second day, leaving only to explore caves, secret beaches and hidden lakes by kayak and row boat, before falling asleep once again to the ambient sound of the calm waters. Meet your driver at your hotel for an early start to Halong city, through the countryside and farmlands of the Red River delta. Arrive at Hongai habour around midday and checkin to your beautiful old junk boat, the Legacy Cruise. Enjoy a welcome drink as you set sail. 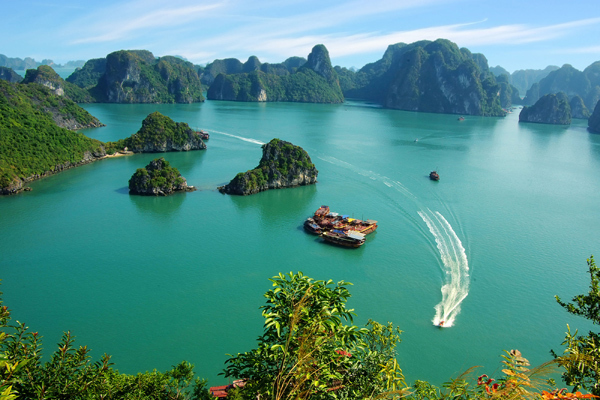 A delicious Vietnamese lunch is served as you cruise through Halong Bay out into Bai Tu Long. In the afternoon visit the splendid Surprise (Sung Sot) Cave. This is one of the most beautiful grottos in the bay with impressive stalagmite and stalactite formations, many of which bear their own legend. Take the opportunity to kayak around the Surprise Cave area, paddling through the towering rock pillars and through the hidden tunnels. Back on the Legacy Cruise, cruise to Drum cave to dock for the night. Pass by many beautiful islets which the locals have nicknamed after the variety of things they resemble: man’s face islet, saddle horse islet, fairy lake, drum cave and virgin cave. Spend the rest of the evening relaxing on the sundeck and getting to know your fellow passengers and the friendly crew. Dinner will be served in the restaurant where there is also equipment for karaoke and movies later in the evening! Relax and enjoy the peaceful quiet of beautiful Bai Tu Long at night. Start your day early and soak in the peaceful atmosphere with coffee with coffee and tea. Enjoy breakfast on board in the morning sun before transferring to a day boat for your second day of exploration. Head into the Lan Ha Bay area to visit Three Peach Becah or Soi Sim island. Spend the morning swimming in the shadow of the towering cliffs and relaxing on the quiet beach. Keep cruising on toward the mysterious Light and Dark cave area, have lunch and then set off exploring the cave by kayak. There is plenty more time for more beachside relaxation before visiting a floating pearl farm in the afternoon. Learn the techniques for extracting high quality pearls and peruse the shop for your own piece of the bay to take home. Cruise back to the Halong Legacy for your second night. Enjoy another family style feast and socialise with your fellow guests, or go squid fishing with the crew. Start your day with sunrise and Tai Chi exercises on the deck. Have your breakfast while cruising and then take a small local bamboo boat out to visit Vong Vieng floating fishing village. Your guide will give you some information and interesting facts about this fascinating village and its local community. Head back to boat to start the journey back to the harbour, passing along the most picturesque routes in the bay. Soak in the beauty and take some last minute photographs. Before the end of the trip, take part in a mini Vietnamese cooking class before sitting down to your final extravagant meal. At the pier, say goodbye to the crew and return to Hanoi for late afternoon. Necessary things to bring: Passport (a valid passport is required on check-in), sunglasses, hat, insect repellent, swimsuits andcash.